If your dog is suffering from a dry, hacking cough as if something is stuck in its throat, your pet may have kennel cough. Also, known as tracheobronchitis, it is one of the world’s most widespread canine diseases. Kennel cough is mainly caused by Bordetella bronchiseptica bacteria. Several viruses may also contribute to this problem. Such viruses include canine adenovirus, reovirus and the canine herpes virus. Dogs become infected after inhaling bacteria or virus particles into their respiratory tract. The risk factor is high when dogs are exposed to crowded and poorly ventilated conditions, such as that found in many kennels and shelters. Other risk factors include cold temperature, exposure to dust or cigarette smoke, and travel-induced stress. Direct contact with infected dogs or contaminated objects can also increase your pet’s chances of developing nasty canine cough. Symptoms of kennel cough include intermittent coughing that increases at night, coughing triggered by exercise, runny eyes, nasal discharge and vomiting mucous at the end of a coughing spasm. 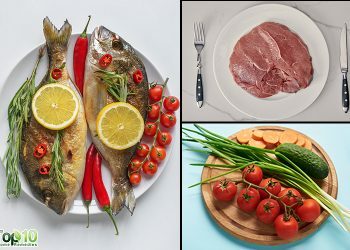 There will also be loss of appetite and a reduced energy level. The symptoms occur within 2 to 10 days after exposure to the infectious agent and normally last for about 10 days. The problem usually clears within 3 to 4 weeks. However, the recovering dog remains contagious for up to 14 weeks. Fortunately, there are several easy home treatments to make your pet more comfortable and promote a speedy recovery as well as prevent future infections. Note: An ongoing kennel cough infection can lead to pneumonia, so get your pet checked by a veterinarian if your pet does not show signs of improvement within the expected amount of time. Here are the top 10 home remedies for kennel cough in dogs. 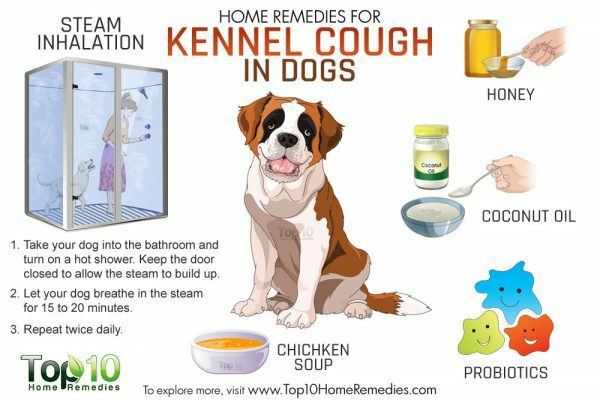 Steam is the easiest and most effective kennel cough home remedy. The warmth of the steam helps open up the bronchial tubes of the infected dog, which in turn helps clear extra phlegm from his or her throat. Once your pet gets rid of the phlegm, he or she will start feeling better and the healing process will also speed up. Take your dog into the bathroom and turn on a hot shower. Keep the door closed to allow the steam to build up. Let your dog breathe in the steam for 15 to 20 minutes. Note: Do not leave your dog unattended in the bathroom. Another effective home treatment for your infected pet is honey. The antibacterial property of honey helps fight the bacteria responsible for the infection. Honey even helps alleviate the nasal discharge that accompanies kennel cough. Plus, honey has an immune-boosting nature that helps build your pet’s immunity to fight off any kind of infection. Give your sick pet ½ to 1 teaspoon of honey, 3 or 4 times daily until the cough is cured completely. Alternatively, mix 2 teaspoons of honey and 1 teaspoon of lemon juice in ½ cup of warm water. Give this mixture to your pet twice a day for a quick recovery. In recent years, coconut oil has gained huge popularity as an effective kennel cough treatment in dogs. 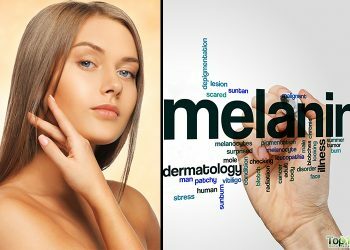 The medium-chain fatty acids in coconut oil help kill harmful bacteria, viruses and other microbes. Give 1 teaspoon of coconut oil per 10 pounds of your pet’s body weight daily in divided doses. As most dogs like the taste, coconut oil can be fed from a spoon or added to your dog’s food. You can also add 1 teaspoon of honey in 1 teaspoon of coconut oil and feed it to your dog a couple of times a day. Regular use of coconut oil will even help prevent your dog from becoming infected. Though it may take some searching to locate a food-grade hydrogen peroxide, it is highly effective at suppressing a cough. Furthermore, peroxide aids in killing the harmful agent that causes kennel cough. 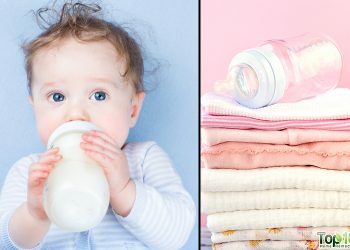 Food-grade hydrogen peroxide is pure and usually highly concentrated at 15 percent or higher. Dissolve 1 teaspoon of raw honey in about 6 ounces of warm water. Then, add 3 drops of food-grade hydrogen peroxide. Soak a piece of bread in the solution and feed it to your pet. Repeat this remedy twice daily. You can also use diluted hydrogen peroxide to sterilize water bowls and other items used by your pet. When dealing with a pet suffering from kennel cough, you must not forget about the importance of vitamin C. This vitamin helps speed up the process of recuperation in your dog. You can boost the immune system of your dog by adding a bit of vitamin C to his or her diet. Consider giving your dog 500 mg of vitamin C (half that amount for small dogs), 3 times per day for as long as the infection lasts. However, if you have any doubts, it is best to ask your veterinarian about giving vitamin C supplements to your pet. Oregano oil has antifungal, antibacterial and antiviral properties, which are effective at treating colds and coughs in pets as well as humans. This essential oil contains powerful phenols, such as carvacrol and thymol, which have the ability to kill harmful bacteria and microbes responsible for this infectious disease in dogs. Add 2 or 3 drops of oregano oil to your pet’s meal and feed him or her 3 times a day. 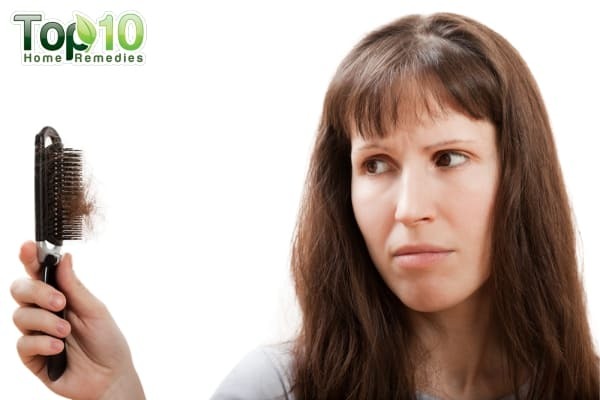 For topical use, mix 1 drop of oregano oil with 1 teaspoon of coconut oil. Apply it on your dog’s neck and throat area to ease discomfort. 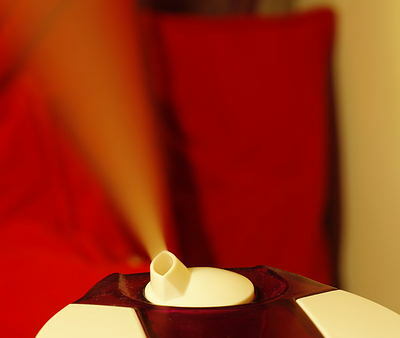 You can even add a few drops of oregano oil in your humidifier. 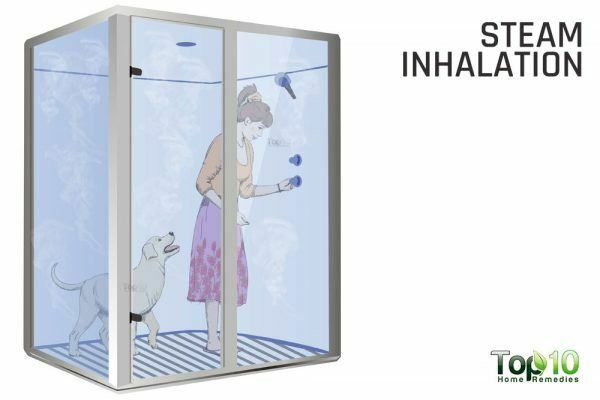 Put it near where your pet spends the most time to aid smooth breathing. Probiotic foods like yogurt have great nutritional value for humans as well as their four-legged companions. Probiotics help get rid of harmful bacteria from your pet’s system, so that he or she can start feeling better soon. Probiotics are also a known immune booster, which is important to fight off any infection. 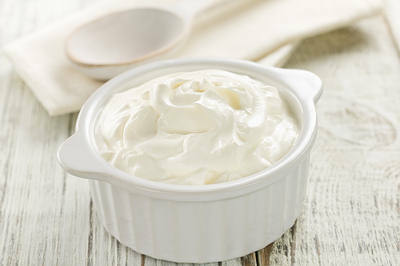 Include yogurt in your pet’s diet for the treatment of kennel cough. You can also give probiotics in supplement form, after consulting your vet. Note: If your pet has been prescribed antibiotics, do not give your pet antibiotics and probiotic supplements at the same time. There should be gap of at least 2 hours between the two. Herbal teas like licorice tea and sage tea can be of great help in soothing your beloved dog’s cough. These herbs contain anti-inflammatory, antiviral and antimicrobial properties that help fight infections and reduce inflammation in the airways. Heat 2 cups of water in a pot. Add 1 teaspoon of licorice root powder in it. Bring the solution to a boil, then simmer for 5 minutes. Allow it to cool to room temperature, then strain it. 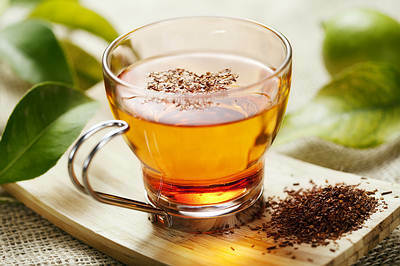 Mix 2 to 3 teaspoons of this licorice tea in your dog’s meals, twice daily for a few days. You can store the remaining tea in the refrigerator for up to 5 day. This remedy may sound strange, but it’s very effective and ensures faster recovery. Chicken soup is a nutritious food for your sick pet. The antioxidants in it help fight upper respiratory tract infections and even speed up the healing process. 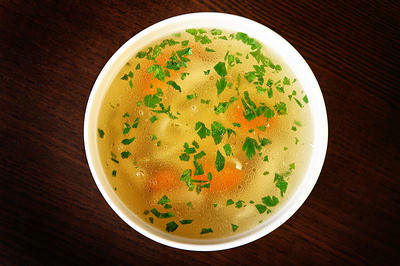 In addition, chicken soup improves the functioning of the immune system. Serve small amounts of homemade chicken soup to your dog a few times throughout the day. For best results, sprinkle some cinnamon powder over the chicken soup before feeding it to your pet. For quick healing, keep the air in your house moist when your dog is suffering from kennel cough. 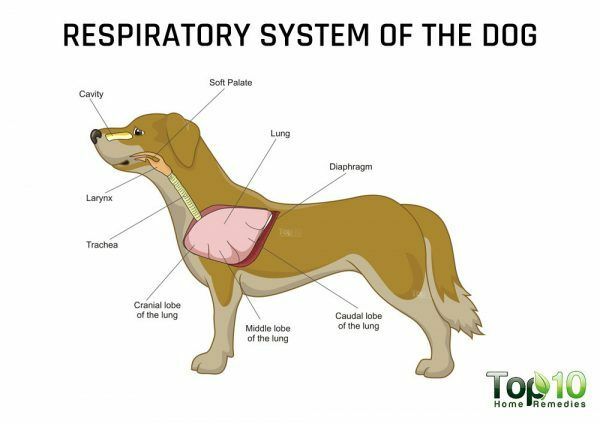 Moist air will prevent your dog’s throat from becoming too dry. This will soothe the throat and your dog will not have to struggle as hard to breath. It will also help your pet sleep better, which is essential for recovery. Put a vaporizer or humidifier near your pet’s bed or wherever it sleeps. Alternatively, turn on your air conditioner if it has a built-in “humidifier mode” to add moisture to the air throughout your house. Keep your children away from your infected pet, as children are more vulnerable to infection. To help your pet recover quickly, keep the environmental conditions healthy and dust-free. Do not allow your dog to lie down on moist or cold floors. Regularly clean the dishes as well as toys used by your pet. Keep your pet warm while sleep by putting a light blanket on his or her body. Encourage your pet to drink a lot of fresh water to keep the body hydrated. Remove your dog’s collar to stop it from stimulating coughing. You can use a harness instead of a collar, especially if your dog strains against its leash, to minimize the coughing. Avoid smoking in the house and do not use any kind of toxic cleaners to clean the floor. Keep your infected dog isolated from other dogs as much as possible to prevent spreading the infection. Wash your hands thoroughly before and after every encounter with your sick dog to prevent transferring opportunistic bacteria. Sometimes a dog may need antibiotics prescribed by a vet in order to treat a secondary bacterial infection or prevent one from developing. To prevent future infections, consider a kennel cough vaccination. This type of vaccine is effective against the major causes of kennel cough and gives 12 months of protection. I started my dogs on honey and coconut oil! Thanks for the information I hope it works and if anyone has tryed this can they tell me if it works!